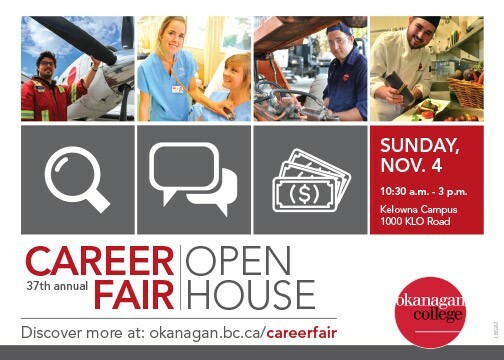 Please join Okanagan College for the 37th annual Career Fair on Sunday, Nov. 4, 2018. Employers, register as an exhibitor! This is your opportunity to network, recruit new employees, promote your organization and connect with students and job seekers. For more information about the fair visit www.okanagan.bc.ca/careerfair. The career fair will be held at Okanagan College in Kelowna, British Columbia. Please confirm your attendance by registering by Oct. 12, 2018. If you require more information, please call 250-862-5473.